Thought I would do a thing! The differences of Kabalmystics Sonic models arent really too noticable, albeit something to write home about until compared with other models, for instance Game!Sonic (My name for the Sega Sonic model in the center). The new model is on the right while the older KM!Sonic model is on the left. You can clearly see the newer model is JACKED (MMH, Size difference)! Look at the arms on the newer model (Right). I still think this was adorable to make. 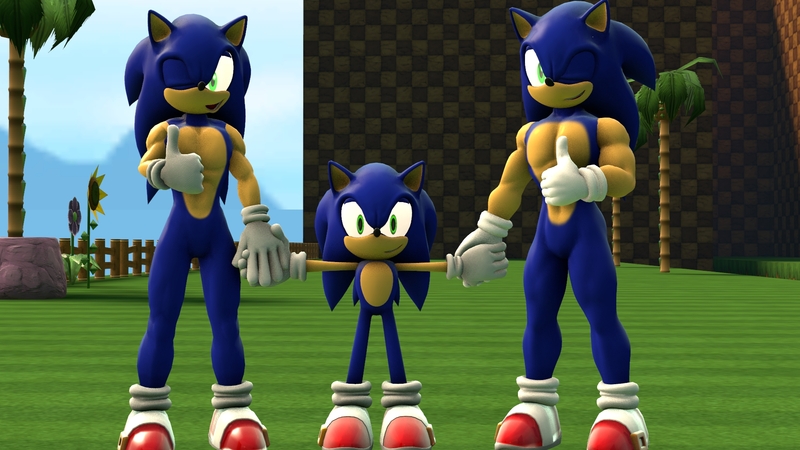 Mind you my inbetweeners couldnt help but do their thing when I was playing with KM!Sonic Models, especially the new one, he is freaking huge.